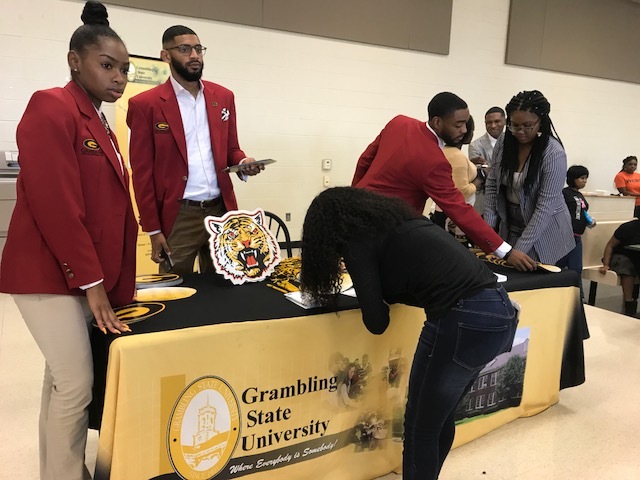 DALLAS — Grambling State University was well represented at last weekend’s State Fair Classic, but before the big game, GSU representatives visited several Dallas-area high schools to share good news about why it’s great to be a part of the GramFam. The “Tour of Schools”, which is an annual tradition, included the university’s royal court and a group of ambassadors who visited schools the Thursday and Friday leading up to the State Fair Classic. Included in this year’s tour was the relatively new Uplift Mighty Preparatory charter school in Fort Worth, which will be graduating its first class this academic year. Of the school’s 39 seniors, GSU has admitted 10 of them. They GSU groups also visited Hillcrest High School, W.W. Bushman Elementary School, Lancaster High School and DeSoto High School. DeVaria Hudson is celebrating six months as the director of admissions and recruitment for GSU and she’s excited about what she and her team are doing to get students interested in Grambling State. “It fills my heart to see that we are actually introducing students to an affordable education and also a quality education,” said Hudson, a Grambling, Louisiana, native. Dallas is one of GSU’s primary markets for recruiting. Louisiana provides most of the institution’s students, but Texas provides the next largest number of students. That’s why the school spends some time recruiting each fall during the State Fair Classic weekend when GSU plays Prairie View A&M University at the Cotton Bowl. GSU President Rick Gallot, GSU Student Government Association President Adarian Williams and Jimmitriv Roberson, Miss Grambling State University, led the royal court and several student ambassadors through the hallways, into auditoriums and during meal time in cafeterias to get students interested in what Grambling State has to offer. On-site admissions were offered to 73 students during the recent Chicago Football Classic weekend when the football Tigers played the Clark Atlanta University Panthers, and more students were admitted as recruiters visited Dallas. During the school visits, student ambassadors gave students a sense of what it’s like to be a GSU student, shared their various experiences and said what they like about the school. They were honest and open, and easily talked about the school’s rural location right off of I-20, and transitioning from a major metro area like Dallas-Fort Worth. Conwright loves Grambling State so much that this is her fourth or fifth year attending the Tour of Schools. She said area school recruiting has been a tradition for the Grambling University National Alumni Association Dallas Chapter for at least 30 years, and credits the idea to two chapter members, Greta Burton and Roselyn Ratcliff. Hudson said ongoing recruiting is critical, and recruiting in Dallas is important. This year’s enrollment has increased to over 5,100 students, a seven percent increase from fall 2016. Gallot, Hudson and other GSU leaders want to see that number continue to grow. One idea is starting early. The first school GSU representatives visited Friday was W.W. Bushman Elementary School. Though some might think visiting an elementary school might be a waste of time, but Hudson and others think it’s important to start exposing students to the idea of attending college early. They also believe it’s never too early to start preparing for college. The walls in W. W. Bushman Elementary were filled with college and university banners, flags and information, including Grambling State University, North Carolina Central University, Tuskegee University, Spelman College, and Texas Southern University. W. W. Bushman Principal Yolanda Knight has been in her job for four years; she was excited to see GSU visit for the first time. “We want college to stay with them so that 10 years from now they’ll know this is where I’m supposed to be,” Knight added. Vanessa Satchel, 9, a Bushman Elementary fourth grader had the honor of introducing Miss Grambling and the royal court to an auditorium audience of her peers. When she grows up she wants to be a lawyer and maybe be a college president. Gallot pinned her with a GSU lapel pin as she smiled broadly. “When colleges come to visit, it gives me a chance to think about all the things that college does and if I want to go to that college or not,” said Satchel. Alexis Glaspie, 17, a senior at Lancaster High School, signed up to get more information about GSU. Although she wishes more colleges and universities would visit her school, she was happy that she got to see Grambling. “It seems like Grambling has a whole bunch of school spirit,” said Glaspie.